When the International Criminal Court (ICC) intervened in northern Uganda, it seemed that the interests of both the ICC and the Government of Uganda (GoU) would be served. The newly established Court was seeking a situation where it could 'cut its teeth'. How better to demonstrate its potential, to establish itself as a player in international relations and to gain legitimacy than by targeting the Lord's Resistance Army (LRA) and its universally condemned leader, Joseph Kony? For the GoU, the ICC was a new and useful political “weapon” in its decades-long war against the LRA. In explicitly referring “the situation concerning the Lord’s Resistance Army”  , rather than the situation in northern Uganda, to the ICC, it was the Government's belief that the international community would put its weight behind the GoU's military efforts. The subsequent decade, however, has yielded a distinctly different story. In 2005, the ICC unsealed arrest warrants for five top LRA commanders – Kony and his second-in-command Vincent Otti, as well as Dominic Ongwen, Okot Odhiambo and Raska Lukwiya. But even before the indictments were issued, a debate about the appropriateness and consequences of the ICC's intervention had erupted. The debate, now well known by its “peace versus justice” moniker, reflected concerns regarding the alleged effects of the ICC on conflict and peace processes. On the one hand, it was argued that the ICC would marginalize the LRA by stripping it of support from the Government of Sudan, which had deployed the LRA as a proxy force in its own regional military campaigns since the mid-1990s. This isolation, it was argued, would leave the LRA with no option but to enter peace negotiations. On the other hand, critics argued that the ICC was an unhelpful and belligerent intrusion that risked undermining ongoing attempts to end the conflict peacefully. The ICC removed incentives for Kony and his high command to sign and follow through with a negotiated peace agreement. Local religious and civil society figures further asserted that criminal prosecutions undermined their efforts to encourage LRA combatants to defect and receive amnesty through Uganda's Amnesty Law (2000) and that retributive justice was insensitive to traditional approaches to achieving justice and reconciliation. If prosecution was necessary, they argued, it should be properly sequenced with ongoing efforts to achieve a mediated political solution to the war: peace first, justice later. At the same time, the GoU and the ICC had made clear that the Court's role was to target the LRA – and not the Ugandan People's Defense Forces (UPDF). Victims and survivors of violence in northern Uganda, along with long-time observers of the conflict, saw the Court's focus as an inherently biased approach to prosecuting the war. It was well documented that the UPDF had also been responsible for atrocities against civilians. To a large extent, these debates emerged as the framework within which the conflict between the LRA and the GoU was understood. The ICC's effects, however, have been far more mixed than any one perspective or opinion, however persuasive, could capture. With the backdrop of material support from Khartoum dwindling as well as consistent prodding by trusted local religious and civil society figures, the LRA declared is intention to negotiate with the GoU. Peace negotiations took place between 2006 and 2008 in Juba, South Sudan and were mediated by South Sudanese Vice President, Riek Machar. As a result of the ICC's intervention, questions of justice and accountability were, in the words of Lyandro Komakech, “the critical stuff” of the peace talks. Kony and his high command, however, refused to partake directly in the negotiations, putting the fate of the talks in the hands of their delegates instead. This was deeply problematic as many of the delegates sought to satisfy their personal material interests and questions swirled about whether or not they truly represented the LRA high command. From the outset, many senior GoU officials and delegates believed there was no chance of the talks succeeding. The GoU accepted negotiations in order to appease pressure from the international community as well as domestic civil society and religious groups. Importantly, the Juba talks were not the first time that the LRA had entered into negotiations with the government. However, seemingly promising talks in 1994 and 2004/05 were squandered when the government issued rigid ultimatums to the rebels and re-engaged the LRA militarily when they weren't met. Negotiating with the LRA also served the GoU's political interests. With the LRA labelled as a “terrorist” group, the GoU could present itself as a partner in America's global war on terror. The Government benefitted heavily from this arrangement, with the US providing political and material support to the GoU and UPDF. Government officials, including President Yoweri Museveni, consistently reiterated that they favoured a military solution. In a telling account, Museveni told Jan Egeland that the Juba negotiations “were not to our benefit. Let me be categorical -- there will only be a military solution to this problem.” Unsurprisingly, during the negotiations the GoU continued to plan military operations against the LRA and, when the talks concluded, launched Operation Lightning Thunder. It is also hard to argue that the LRA was genuinely committed to the negotiations. During the Juba talks, the LRA continued to attack and abduct civilians. In 2007, Kony ordered the execution of Otti, the senior LRA commander most serious about negotiating a peaceful settlement to the conflict. While some believe that Kony would come out of the bush and sign the comprehensive peace agreement if only the ICC arrest warrants had been dropped, there is scant evidence to suggest that this was the case. John Lacambel, a radio host at Gulu-based Mega FM who was regularly in touch with the LRA high command during the Juba talks, maintains that Kony would never had come out regardless of the ICC warrants because he fears and mistrusts the northern Ugandan community. Michael Otim, a trusted voice on justice and peace issues in northern Uganda who met Kony seven times, adds that there was too much uncertainty facing Kony's fate for him to come 'out of the bush' and sign the peace agreement. Moreover, the LRA rebels, weakened by military strikes and defections, used the relative safety and space afforded to them from the negotiations in order to regroup and re-arm. The ICC, in this context, was the perfect scapegoat to prolong the negotiations. 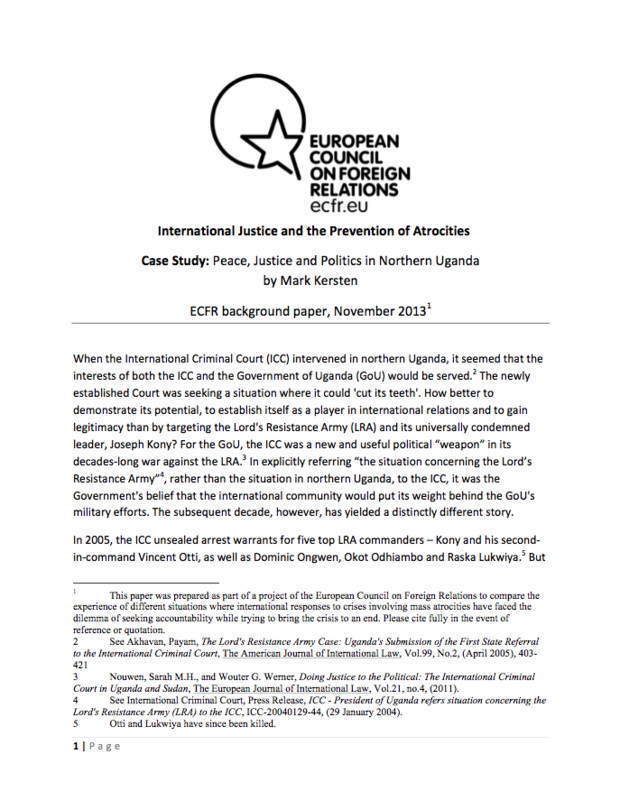 What can be learned from the ICC's intervention into northern Uganda and the developments it spurred? Five years after the collapse of the Juba peace talks and despite the fact that none of the indicted members of the LRA have been brought to justice, northern Uganda has experienced its longest period of stability in decades. In other words, without a successful conclusion to peace negotiations and without criminal accountability for the LRA's top commanders, northern Uganda has achieved a negative peace. As the largely muted reactions to the recent trial of LRA commander Thomas Kwoyelo in Uganda's International Crimes Division suggest, fears that criminal prosecution would undermine peace have withered. As for the Amnesty Act, key sections were left to expire for a year. And while it was reinstated in 2013 at the request of local cultural and religious leaders, few could suggest that the offer of amnesty or the North's stability is threatened by international criminal justice. It is tempting to conclude that the ICC is – at least partially – responsible for the current negative peace that northern Uganda currently enjoys. However, such a causal claim is deeply problematic. After all, the LRA did not sign a comprehensive peace agreement and has not been defeated. Rather, as a result of military overtures on the part of the UPDF, the conflict has been 'exported' to the Democratic Republic of Congo and the Central African Republic, where the rebel group continues to terrorize communities. At best a negative inference can be made: the ICC's intervention did not prevent the most comprehensive peace negotiations between the LRA and the GoU from taking place and has not undermined stability in northern Uganda. Given predictions that the ICC would ruin attempts to achieve peace, this finding is, in and of itself, of some importance and has recently been championed by the ICC's Chief Prosecutor. The experience of the ICC's intervention in northern Uganda also demonstrates how useful the Court can be to actors seeking to stigmatize adversaries and legitimize military solutions. The narrative of a 'good' government seeking to defeat an 'evil' rebel group has been consistently produced and reproduced since the ICC's intervention. This was made clear most recently with Invisible Children's 'Kony2012' video and campaign and the ongoing US military support for the UPDF's hunt for Kony. Lastly, an oft-neglected but crucial lesson is the need for a healthy dose of scepticism regarding the intentions of parties to a peace process. Peace negotiations have become form part of the strategic thinking of warfare rather than necessarily representing a genuine interest in a peaceful solution to violent political conflict. Scholars and observers weighing in on ICC interventions are often too quick to assume that peace negotiations are about peace. ICC arrest warrants and the “peace versus justice” debate may be manipulated and instrumentalised by warring actors – but not necessarily in the interests of peace or justice. Mark Kersten is a PhD student in International Relations at the London School of Economics, focusing on the nexus of international criminal justice and conflict resolution, and creator of the Justice in Conflict website.